Victory Force gives us another glimpse at their workbench with a preview of the greens of their new Storybook Wars Oz models. 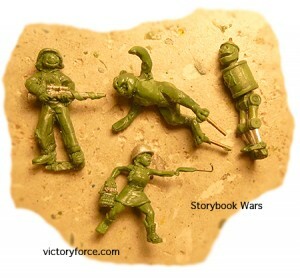 Some New Storybook Wars figures being worked on. All in various stages of completion. Scarecrow with his high speed calculating brain and ability to stay completely still for days on end, is one deadly sniper. The lion is no longer cowardly, enough said. Dorothy carries her 45 and a basket full of grenades and her little dog too.